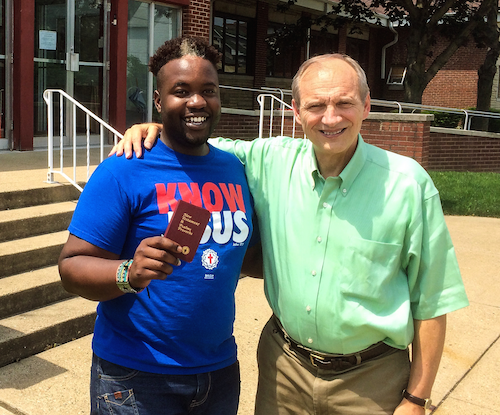 Marcus and Robert, reunited 25 years after Robert first shared a New Testament with Marcus. When I joined The Gideons International thirty years ago, it was to win men, women, boys, and girls to Christ. Soon after, I volunteered through my church to visit a housing project, Crawford Village. It was an area with many children. I volunteered to assist there with Bible school. After Bible school one day, I was leaning against a wall, and a young boy named Marcus Jones came over. I gave him a New Testament and asked if he wanted me to go over it with him. He did, and he listened so attentively that we were there for a long time. We also went through the Plan of Salvation at the back of the Testament. I then decided to walk him home. As he ran into his house, he yelled, “Mommy, Mommy,” and began showing her the New Testament he had received. I didn’t go back to the project for a long time, and I regretted that I didn’t return to mentor Marcus. Finally, I returned to look for him. I was certain I could find him since I knew his name, and he had a birthmark on his hairline with gray hairs, so I could easily describe him. As I asked some of the kids about him, one knew him and told me he had moved away sometime ago. We went on to my church and reminisced. I apologized to Marcus for not coming back sooner to see him and discuss what he had learned. Marcus said it was okay because his family moved to Texas soon after–where he grew up. He added that I had “planted the seed.” As we walked back to my car, I was walking on clouds—not asphalt. I was so thankful to God that He allowed me to meet Marcus again after all these years. My twenty-five years of regret for not revisiting Marcus were finally relieved. And, I was glad I stopped to witness that afternoon. I Corinthians 3:6 says, “I have planted, Apollos watered; but God gave the increase.” We need to be encouraged to keep sowing seed, and God will give the increase. Mr. Cozad, thank you for making yourself available that day, as I’m sure you had many times before and since then and you’ll continue to do by God’s grace. What an awesome gift God gave you to meet this young man again after 25 years!!! I am so blessed by the wonderful work the Gideons do, I love reading the stories of God working His plan using the Gideons!! God bless you and everyone involved with the Gideons and I pray that He will be glorified in and thru every effort made by each one of you. I love reading these stories…How wonderful is our GOD ! ! ! …I say, How wonderful is our GOD…and it’s worth repeating over, and over again!!! Thanks to God and glory forever for His grace of salvation to nations by Jesus-Christ! God bless you Robert for God work! May God use you again to win men for His kingdom! Great testimony of lovely concern for the lost. God bless all dear Gideons, now I have a new tip to practice, wait around the corner, not to leave a heart touch from the Lord on the loose!